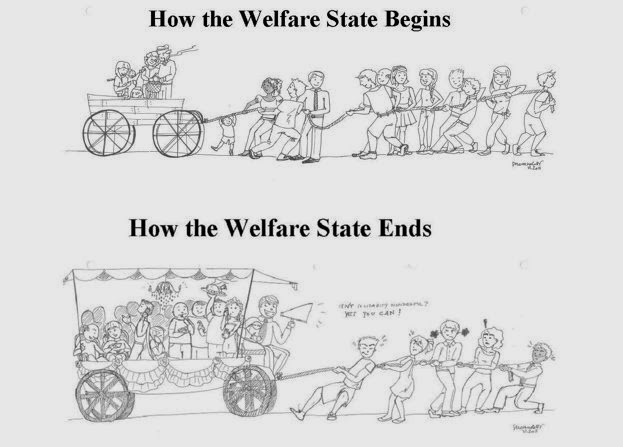 On NewstalkZB tomorrow after the 10am news with Justin du Fresne talking about welfare, social issues and the stuff I generally blog about. This moved me, particularly the second sentence. The State never intentionally confronts a man’s sense, intellectual or moral, but only his body, his senses. It is not armed with superior wit or honesty, but with superior physical strength. I was not born to be forced. I will breathe after my own fashion. Let us see who is the strongest. In the United States, very little wealth is transferred from those fortunate enough to live in abundance to those unfortunate enough to have little. For example, some of the chief recipients of transfer payments in the United States are the elderly — those who are most likely to have amassed significant wealth and comfort over the course of their working careers; and the source of the transfer payments is largely the young — those who are just starting out on their careers and have little income or wealth to their names. I'd take issue with that specific example but the point he makes is otherwise valid. There is a great deal of 'churn' from the haves to the have-nots whose degree of economic separation isn't great. Which only serves to create power and control for bureaucrats. 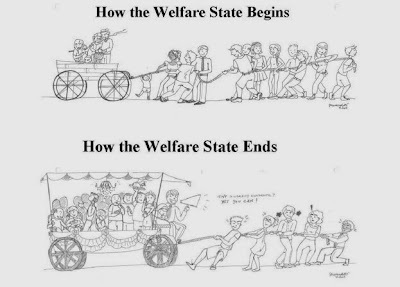 If you think this is only a contemporary observation, past welfare states (eg legislated parish-collected compulsory tithing) exhibit the same life cycle. A new Civitas book proposes a sweeping overhaul of the benefits system which would see National Insurance abolished and replaced with a system of personal welfare accounts that would put the contributory principle back at the heart of social security. The accounts could be used for saving, insurance and even loans - helping people spread the costs of unemployment, parental leave, higher education and old age across their lifetime. Of course people would be compelled to contribute to these accounts which finds disfavour with libertarians. My position has always been I'd rather be compelled to provide for myself than compelled to provide for someone else. Beyond Beveridge can be found here. No, I haven't read it yet. And at 179 pages I probably won't. employers’ NICs should become a Payroll Tax. be used to boost workers’ pension accounts. would then get the non-contributory Universal Credit). I am "stunned" by the audacity of the Child Poverty Action Group in their comments about the error in CYF data collection and reporting. Child Poverty Action Group researcher Donna Wynd said she was "stunned" to learn of the massive under-reporting. Wynd has recently (inadvertently?) been involved in her own case of massive under-reporting. In their latest analysis of CYF abuse data, the percentage of children with a substantiated finding of abuse living in each site office area was under calculated by 10 times. Originally their report stated, '...the proportion of 0-17 year olds who were victims of abuse in Papakura was not 4.0% but 0.40 of 1%.' "
Then they calculated the rate of benefit dependence using the total population rather than the relevant 18-64 population resulting in another "massive under-report". Ministry chief executive Brendan Boyle said data from 2011 onwards was affected. "The initial review of data shows a margin of error mainly around 2 to 3 per cent, up to 8 per cent." Donna Wynd of Child Poverty Action said: "All they're doing is keeping a tally. How you can make such a simple error?" Goodness Donna. So much charity. Child, Youth and Family is to reveal this week the true extent of abuse, after finding it has been under-reporting notifications by as much as 8 per cent. The number in the past year is believed to be between 1,000 and 4,000 more than the 49,398 reported. From memory (the data is currently off-line) there were 121,000 notifications in the last year available. 49,398 will refer to those requiring follow-up I imagine. The actual number of substantiated findings in 2011/12 was 21,526.